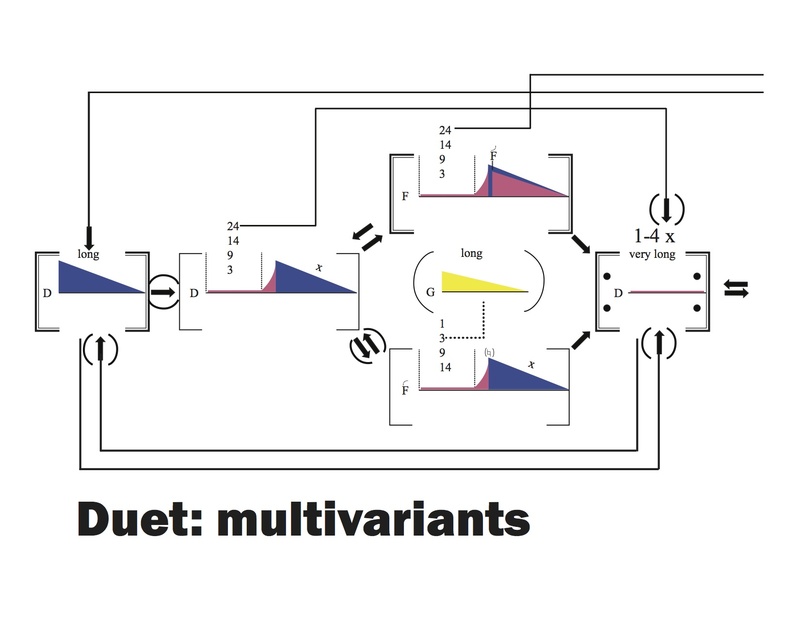 Duet: Multivariants uses a structural approach based on literary multivariant structure. Multivariant structure can be found in the iconic Chose Your Own Adventure books (and even earlier, in fact, in certain modern and post-modern literature). Today, this structure is most commonly used in hyperlink art. In essence, multivariants represent the ways one can navigate between different discrete models. Some examples are a split (where one has the option to go to one of two or more different modules), a join (where two different modules lead to the same place), a bypass (where one module leads past numerous others to a further point), and a loop (where a module leads back to an earlier point in the series). In my duet, I create modules (using square brackets) in which I place musical material for the two instruments performing. One is blue, the other pink. I provide arrows that indicate which choices the performers have, and certain other symbols (numbers within the boxes, text indications) to indicate duration. The score is a map because it allows for a full navigation of musical material, but in a sense functions more like a dungeon in a video game than a traditional map. Certain things change by returning to certain places, such as durations, and certain things (such as those yellow modules that are linked with a dotted line) are only unlocked by returning to other modules a certain amount of times. By creating this type of musical structure, I allow the musicians to perform and realise a piece of music that is elastic, modular, and ever-changing, yet still born of the same kernel idea. I use this approach because I believe it invites the musicians involved to engage more closely with the material, be more active in the performance, and invest in creating a realization that is true to themselves as players.